There is no substitute for a comfortable pillow while camping. Some people think camping and experiencing the outdoors means you must endure some degree of the uncomfortable elements, but that is just not so. A prepared camper wants to enjoy their night of sleep just like anyone at home does. Being well rested allows you to fully enjoy whatever adventures come your way in the morning, and proper bedding is essential for a good night’s sleep. Investing in a great camping pillow will make you want to head out and experience the great outdoors even more often. In first place, our gold pick for the best camping pillow goes to the Teton Sports Camp Pillow. It wins top prize for many reasons; price, comfort, durability, and Teton’s quality and customer service. 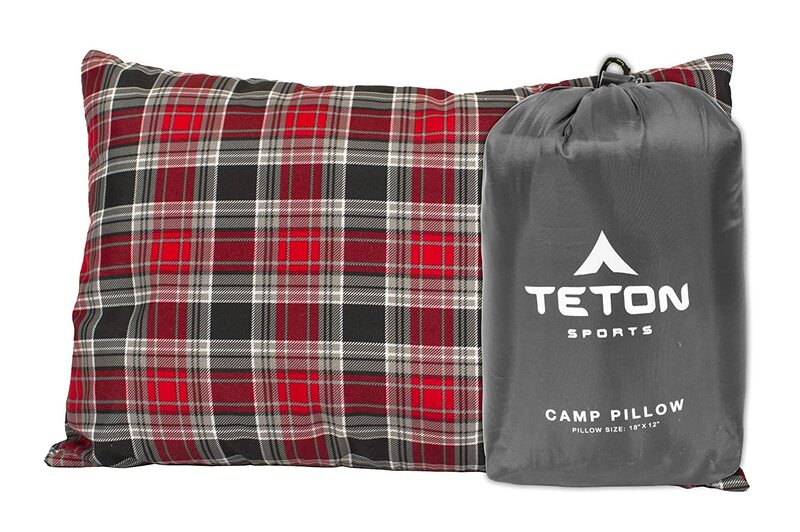 To begin, the Teton sports camp pillow is priced between $10-$15 on Amazon Prime depending on your color preference. This will be a breath of fresh air for anyone putting together a camping collection. Camping gear can be extremely costly. While the initial investment is absolutely worth it considering how many times you can use your gear, having a well-constructed yet inexpensive addition to your camping essentials will bring a smile to your face. Don’t underestimate the difference a good night’s sleep can make. It is a commonly overlooked item that pays for itself over and over again as you enjoy your rest. The Teton pillow comes in four different color options. The checkerboard pattern on three of them is a classic rugged style with alternating red and black designs, or an alternative solid gray design. All of the color options can be coordinated with the liners of the Teton brand sports sleeping bag liners, allowing you to fully match your camping bedtime apparel. The size is 18″ by 12″ inches when you are ready to lay down your head, a compact size but still absolutely big enough while you lie in your tent. When packed down its even smaller. It comes with its own taffeta stuff sack with drawstring closure and when packed in measures at 9.5″ by 6.5″ by 5″. It weighs less than half a pound making it a good fit for backpackers or car campers, you will not even notice you packed it. The pillow itself is filled with SuperLoft Elite 4-channel fill which is designed for long lasting durability. Even if you plan on camping every weekend of the summertime, it will retain its fluffy comfort again and again. Unlike some other camping pillows it will stay flat while you are sleeping and not bunch up in one area.The washable and removable case fits is non-shrink brushed flannel, and is machine washable for convenience once you are back in civilization and ready to unpack and clean your gear. Having this pillow that is so easy to pack and not quite as big as a full sized pillow will make your life much easier while camping. For optimal quality control, leave it out of the stuff sack when you get home and the pillow will retain its loft for years to come. The pillow also comes with Teton’s limited lifetime warranty for your peace of mind. The Teton brand is trusted by outdoor enthusiasts and professionals alike. With some of the best guarantees on their products in the industry, reviews from customers are consistently excellent and they back up their warranties with replacements or repairs should a rare defect in workmanship occur. They offer sleeping bags, backpacks and travel luggage, tents, cots and camp pads, outdoor apparel and other outdoor accessories to round out your Teton collection. Teton also has a great social marketing strategy that will appeal to professional outdoorsmen, with built in media platforms that can help outdoor photographers and journalists. If you are building a camping apparel collection from the ground up, you would be wise to consider an entire purchasing an entire line of their gear. Publicizing your photos or articles while showing off your Teton gear might help you gain exposure in the industry in addition to keeping you comfortable on all your adventures. While the Teton camp pillow is not the smallest on the market, it does offer great comfort at a relatively small pack size. It is a slight drawback that the pillow itself is just a tad too big to fit into your Teton sleeping bag stuff sack. But with a little ingenuity you can find a way to tie together your sleeping bag and pillow stuff sacks for more convenient packing and carrying. What makes the Teton pillow such a great option is that it is compatible for backpacking or car camping. It won’t weigh you down but will offer you great comfort at a wonderful value. It certainly deserves its excellent reviews and our gold pick status. Our runner-up silver pick in this category is the Kuda Outdoors Ultimate Self-Inflating Camping pillow. Kuda is proud of this pillow, claiming that it is so comfortable you won’t want to get out of bed. Customers seem to agree with that claim with consistently high reviews. The regular retail price comes in at around $30, although on Amazon Prime and some other retailers you can potentially pay just half that. The Amazon Prime price is currently just $15.99, making it an incredible value for its quality. The key to the comfort seems to be Kuda’s sewn-in contour in the middle of the pillow. The indentation creates a contour that fits around your head and stays inflated and comfortable all night long. The idea of self-inflating might not be as appealing to some backpackers, but for many it allows customized comfort that cannot be beat. It is designed to be inflated to 50% capacity and then further inflated to create a firmness that is perfect for you as an individual. It inflates when you blow into the valve, so no motorized inflation device is necessary. Kuda created a pillow that is functional and stylish with two color options of dark blue or a vibrant orange. The bright colors won’t fade over time, keeping your gear looking sharp for many years and also indicating the quality of the materials their gear is constructed from. Exceptional customer support amounts to a large amount of customer satisfaction, with a 60 day money back guarantee. You can purchase this product without worry knowing that if it just doesn’t seem right for you, you can send it right back without customer service asking any questions. The Kuda camping pillow is exceptionally small and lightweight, making it a great option for car camping, backpacking, or plane travel. At only eight ounces or half a pound, the entire pillow is an ideal yet small size once inflated at 11.8″ by 19.6″. Kuda used the best polyester available and inserted a layer of foam inside for additional comfort. It won’t be noisy while you are trying to rest like other inflatable pillows that let out air or crackle all night long. The layer of foam also insures that the pillow won’t develop any sharp edges when inflated that could cut into your skin and disturb your rest. The polyester exterior is a great choice for those that desire little maintenance once they return home, and can be easily cleaned with only a damp cloth. For some travelers that prefer minimal maintenance between trips, this eliminates any washing and is a welcome feature. For anyone more concerned with the adventure the next day will bring, it eliminates a step of cleaning and allows you more time to explore. The Kuda inflatable camping pillow comes with its own carrying case that helps you pack in and compress your gear to a comfortable traveling size. It does not leak air like many other inflatable items, but when it is time to deflate it and pack up, you’ll have no trouble packing it back in its case with the included plastic band. 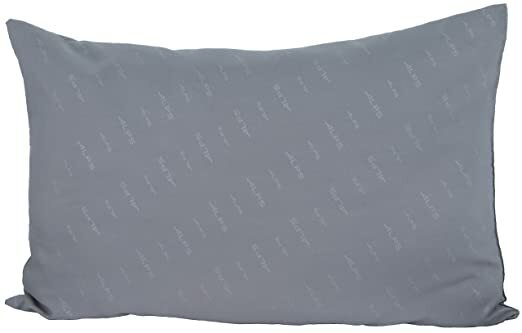 For anyone that loves camping or spends time needing a rest in a car or airplane, the Kuda pillow is a fantastic and easy option at a great price point and customer service guarantee. Our third place bronze pick is the very deserving ALPS Mountaineering MicroFiber Camp Pillow. This exceptional product comes in three different sizes for whatever your adventure might require. Pricing between the sizes of pillows starts from the smallest size of 10″ by 20″ for about $12 on Amazon Prime. The second size option is 16″ by 24″ inches for about $19 on Amazon Prime. The 16″ by 24″ option is classified as large and actually has two different fill options. The less expensive option will cost you only about $15 on Amazon and it potentially available cheaper on Amazon Prime or from other retailers. It includes TechLoft + Insulation and a stuff sack. For only a nominal amount more you can buy the same size pillow that has a softer microfiber fabric which is certainly our recommendation. What is just a few dollars more when it comes to providing comfort for your entire trip? This soft microfiber is standard in the smaller 10″ by 20″ size, and both sizes fit into a custom made stuff sack for easy transport and storage. The stuffed dimensions for the smaller pillow are 6.5″ by 9″ with a weight of only half a pound or eight ounces. The stuffed dimensions for the larger option are only 7″ by 10.5″ with a weight of one pound or 16 ounces. Both options are easy to pack and transport with a standard included drawstring stuff sack. What ALPS tried and succeeded at doing was creating a pillow that has a fabric so soft you will be indulged and as comfortable as you are at home. The small size is an ideal choice for backpackers or children but will seem too small for most adults that crave an adequate sized pillow. Car campers or those without size restrictions will enjoy the larger size and still benefit from the comfort and small packable size. The major benefit of a compressible pillow is the easy packing and adaptability to your storage situations. However it is always advisable to store your camping pillow not compressed and laid out flat for a longer life and better loft quality. Every consumer has a very different idea of comfort that should be provided by a pillow. This option has a more minimal fill that more closely mimics a down filled pillow. Not everyone will be pleased by this amount of fill, especially those that feel they require a very firm and hard surface to be comfortable. But this same feature makes the smaller sized pillow an excellent purchase for in-flight travel. It is a budget option that will work for children and will make them feel included if you have the larger size. Consider purchasing one of each size to test out the size, if nothing else they will be great travel pillow and you will not regret your purchase. One of the major complaints with this product is that consumers assume with purchase they are receiving both the large and small sized pillow. You will receive only one pillow per purchase, but the quality will impressive you enough to make you want to buy another as soon as you spend one comfortable night’s sleep enjoying it. For the price, materials, and versatile options, these ALPS pillow are a clear top pick in out camping pillow category. Our budget pick for the best camping pillow that won’t break your bank account is the incredibly well valued Stansport Outdoor Portable Camp Pillow. Normally listed at $14 on Amazon but with a savings of almost 33% on Amazon Prime, you can get this for just $9.50 and possibly lower on other online retail sites. The Stansport Pillow is mid-sized for travel and measures about 14″ by 18″ when unfolded and ready for your head. It’s outer shell is washable flannel plaid which allows for convenient machine washing when you are back home and luxurious comfort while you are away. At less than half a pound, it could be a favorite for car camping, plane travel, or even backpacking. The soft polyester hollow fiber fill is not too soft and not too firm for the perfect night’s sleep for so many users. Hammock campers will count the Stansport pillow among their favorites. The flannel pillow cover is warming to the head on cool evenings but the fill will not be overly hot if you are camping in the summertime. The overall fluff is towards the low-end, but the size of the pillow is ample enough to make it foldable and comfortable no matter your preference. Depending on the activity you plan on during the day and your preference at night, this pillow might for its low price delivers a great amount of value for the money. It is not overstuffed but the exterior is well constructed and provides support. When camping some considerations need to be made as to your overall level of comfort and what fits into your budget. 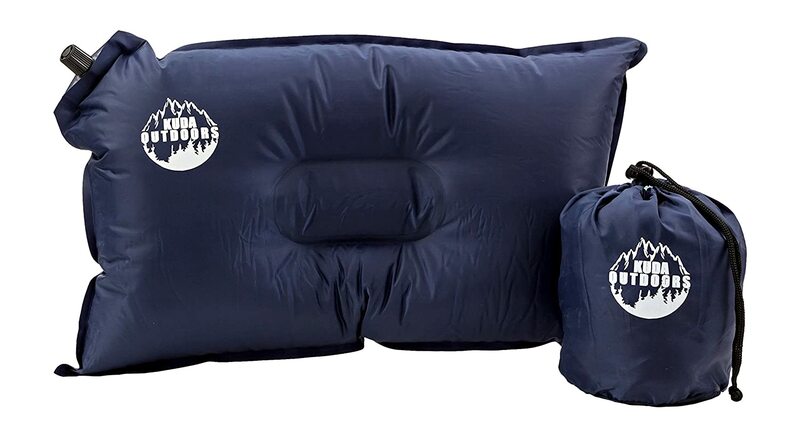 This Stansport outdoor portable pillow is a great option if you need a few hours rest in your car or tent. It might not be the final pillow you buy if you are investing in a lifetime camping apparel kit, but it will work well for a minimal investment. Though the pillow and its case are machine washable, it is not advisable to wash the in its entirety before using it. Many manufactured products arrive with a smell that may be slightly chemical, but washing is not usually the best way to eliminate that smell. To limit off-gassing from new products try hanging them in the sun. The Stansport product with will limited maintenance last a long time at an extremely reasonable price. Its materials are comfortable and versatile for a number of traveling and camping scenarios. If you can’t make it out every year to camp and it isn’t your priority to book sites 9 months ahead of time, investing in a camping pillow is the last thing you need to do. It’s easy enough to pack in your pillow from home for the occasional trip. For the serious camper that heads out on the road all summer or uses their campsite as a home away from home for recreational sports activities its important to have a pillow as part of your set of go-to-gear. The level of care you put into your gear should also factor in, some pillowcases need to be washed while others can be wiped down or used without a cover. WHAT KIND OF SHOULDER AND NECK SUPPORT DO YOU NEED? It is very important to consider the kind of support you need for your neck and back when purchasing a camping pillow. To be frank, if you did not already feel discomfort in those regions you would not be looking up a pillow to purchase. The reason you care to make an investment like this is because you have discomfort and would like to make sure you sleep as well as possible to be your best the next day. Many camping pillows don’t provide the same firm support that some with neck issues need when resting. An inflatable option might be a good investment in this circumstance because it is easily adjustable to your needs in support and can become extremely firm when inflated fully. HOW OFTEN WILL YOU USE THIS PILLOW? When you begin camping you might create an incredible array of camping accessories and gear that would last you a lifetime. But it is important when you purchase your gear to think realistically about how often you will use your gear. It’s important to think about storage and what kind of room you can devote to let things sit out of their stuff bags and air out just a bit between use. If you are not going to frequently use your camping pillow it may be best to invest in one that doesn’t require washing between uses, just so you are ready to go whenever the mood takes you. It’s important to consider your camping gear as entire collection and invest only in pieces that will enhance what you already have. If you only plan on camping minimally and don’t mind sacrificing some quality for a few dollars, any camping pillow will fulfill your need. But if your long term plan includes camping as a favorite recreational activity you need to put the money down and experience the comfort that the perfect camping pillow can provide you on your very next trip. Camping to some is the antithesis of home. Being exposed to the elements and surrounded by life outside of the town and city is not comfortable for many. Those that find pleasure outside the grid and celebrate the great outdoors will enjoy long and happy days exploring the world and experiencing the magic nature can offer. For those that understand why it is important to be outside their element will still feel a little piece of home when they purchase the right camping pillow. The decision is based on your preferences and will make all the difference in enjoying your outdoor vacation.